Chardonnay fancier John McGlothlin assembled an interesting set of Chardonnays, featuring two wines from three different producers and a pair of wines from the same vineyard, one made by the grower and one by another winemaker. 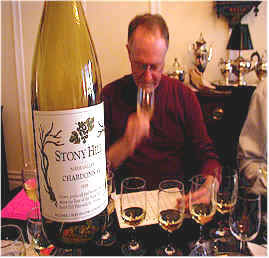 Hoping to raise the level of competency in our tasting group, John graciously poured a brown-bagged "Bonne bouche" of Stony Hill 1999 Chardonnay before the tasting. This was a delightful wine, having the woodsy notes which reminded me of a little Spanish Chardonnay we have in the shop. 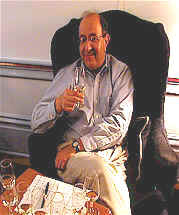 The tasting featured 2000 and 1999 vintage wines. While there is a significant statistical difference between first place and last, the first 4 wines are separated by a mere three points. That means the rankings could have easily changed had Tim Zainer knocked over a glass of wine or had Allan Anderson sneezed. Fifth place through last were separated by a mere nine points, so it would have taken both Tim sneezing and Allan tipping a glass to change those numbers. I didn't find a huge qualitative difference between the wines in this tasting. My last place wine was quite drinkable, "flawed" only by its simplicity. On the other hand, my first place through seventh place wines were all within a narrow band of quality and style. Showing a hint of toasty oak, this wine displays light vanillin notes and a whiff of appley fruit on the nose. It's dry and simple on the palate, displaying a touch of wood and some alcohol. Not bad, just a "little" wine. Half star rating (3 star scale, with no stars being standard or ordinary quality). 7th Place: CHATEAU ST. JEAN 1999 Alexander Valley "Robert Young Vineyard"
I decided I liked this best as it had an exotic pear and nutmeg character on the nose. The palate had a lot of creamy, vanillin notes with a long, toasty oak finish. I can't imagine what caused three fellows to rank it last! Two stars. 6th Place: JOULLIAN 1999 Monterey "Sleepy Hollow Vineyard"
The first aromas reminded me of hay, followed by a bit of toast and then blossoming with pear-like fragrances. As it warmed, I picked up some leesy notes from its aging on the spent yeast. This was rather nice on the palate, not as "hot" tasting as many of the other wines. Good acidity (this probably made it taste 'lighter' and, therefore, less interesting to some of the participants). The nose shows lots of vanilla bean fragrances with mildly toasty oak and a light pear fruit fragrance. It's big, woodsy and toasty on the palate, with a bit of heat from the alcohol. One-and-a-half stars. 4th Place: PATZ & HALL 2000 Sonoma "Dutton Ranch"
Light pear fruit on the nose of this, followed by a creamy, vanillin fragrance. The wine carries a bit of heat in the mouth, being a rich, creamy, vanillin white wine. Half-star. 3rd Place: TALBOTT 1999 Monterey "Sleepy Hollow Vineyard"
I found a lot of appley fruit aromas here, with a slightly over-ripe apple note as the wine warmed in the glass. It's a bit crisper than most of the field and had a slight minerally note. I described this as a "Chablis in a field of Chassagnes." One star. 2nd Place: LEWIS 1999 Napa "Reserve"
I found the nose of this wine to be more "developed" or, at least, showing more maturity than the others. I like the leesy and smoky notes, along with the appley fruit. It's a big, sweet-edged wine (not that it's sweet, but the combination of ripe fruit, alcohol and oak give a 'sweet' note to the wine). One-and-a-half stars. Displaying lots of ripe pear and toasty, vanillin oak notes, there was also a hint of cinnamon spice gracing the nose here. This has enough alcohol to make it taste a bit hot. I found it to have a bit of "bite" as a result. One star.